Six to seven pounds of a luxurious whole boneless Iberian jamón. Like the finest caviar, Iberian de bellota ham is the ultimate of its kind and Cinco Jotas is known as one of the elite brands of ibérico ham in the world. This exquisite delicacy comes from the ancient breed of pig, the cerdo ibérico, which has been roaming the Spanish dehesas (meadows) of southwest Spain feeding on acorns in the wild for thousands of years. Cinco Jotas boneless ham is a timeless treasure that will entice and delight even the most discerning of gourmet palates. 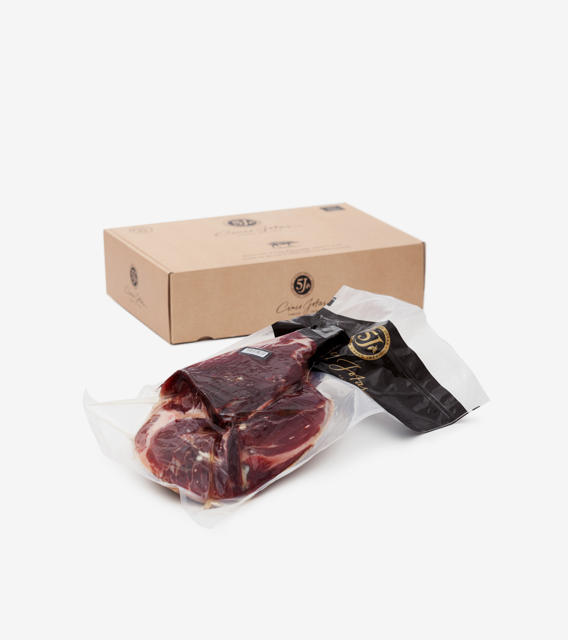 A boneless jamón ibérico is a delicious way to spoil yourself while being good to your body too! The five-year jouney of the 100% ibérico pig from the Spanish dehesas to the dinner table is an exceptional process that culminates in the most luxurious, pleasurable culinary experience you can imagine. The oleic acid in the acorns on which the pig feeds makes the fat of jamón ibérico de bellota one of the truly magical taste sensations as it disolves in your mouth. The depth of flavor is like no other and the luxurious combination of sensations lingers like a fine, aged wine. Can anything this wonderful be this healthy? Absolutely. The fat of jamón ibérico de bellota ham contains over 55% oleic acid (a mono-unsaturated fatty acid). The total amount of healthy fatty acids in acorn-fed cured iberico hams is over 75%, making it the most “cardio healthy” of all animal fats. It also contains vitamins B1, B6 and B12, is an antioxidant, has an ability to lower bad cholesterol levels and is high in Omega 9. Whew, that's a mouthful. And a healthy one, at that! Unlike bone-in ham, a boneless Iberian ham should be kept refrigerated because once the bone is removed, the curing process stops and extra preservation is required. We recommend storing the boneless ham in an airtight container to prevent drying out. Boneless hams can be divided into large pieces with a sharp knife, or sliced with an electric slicer. Any ham that is cut should be consumed immediately, or wrapped in wax paper or plastic wrap to avoid contact with the air. We recommend that you cut only as much as you will consume. 2. Serve the ham at room temperature (approximately 64-72º F) to fully appreciate its unbelievable flavors. Arrange the ham, slice by slice, on a warm, flat plate. Or try it in one of the thousands of delicious Iberian ham recipes! We highly recommend that you enjoy jamón ibérico with your fingers, to have the full multisensory experience! Savoring an authentic acorn-fed Iberian ham is one of the most exquisite gastronomic pleasures you can ask for. By itself is the best way to experience the full multi-sensory culinary delight. 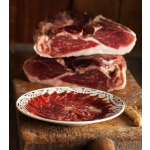 But pairing with other Spanish delicacies can also help highlight the exquisite nuances of ibérico ham. 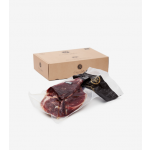 Cinco Jotas makes products of maximum quality, as identified by the black label, certifying that the pigs are 100% ibérico breed, raised free range in the Spanish dehesas (meadows), on an acorn-based diet. While there are excellent varieties of Spanish ham produced throughout Spain, look to the southwest for the absolute finest jamón. The vast areas of land known as the dehesas are an ecosystem of peaceful grazing land dotted with holm oak trees. Jabugo is where the Cinco Jotas black-hooved 100% ibérico pigs thrive. These fat pigs with slender legs are known as pata negra, due to their trademark black hooves. For generations, Cinco Jotas has been committed to preserving and caring for this unique breedoif 100% ibérico pigs, as well as the UNESCO-decreed Biosphere Reserve area of nature where they roam free-range and thrive.